The Österreichring has been re-opened as the Red Bull Ring after lots of investment from the energy drink company. The circuit mirros the previous incarnation of the circuit, the A1 Ring, which was developed out of the Österreichring in the 1990’s after the old circuit was deemed to be too fast to be safe. The track looks quite dull on paper but the gradients and the technical nature of the corners makes it a real challenge. The tarmac is similar to Donington in that it is a really smooth surface so tyre wear isn’t a big issue but ultimate grip can be unless you have a really soft compound. There are a few bumpy braking zones but the track itself is fairly smooth and the kerbs are user friendly and low. Steep uphill approach to this corner. Start on the left hand side of the circuit and as you approach the corner you can brake very late as the circuit climbs steeply in the braking zone. Turn in about 2 car lengths after the ‘50’ marker and aim to clip the flat part of the apex kerb, avoiding the large yellow ‘sausage’ beyond. The exit is tight as the track comes back in towards you so use the kerbs on the exit but avoid using the grass matting beyond as this has less grip and will drag you off and the tarmac run-off here stops abruptly which will put you onto the dirt. Again you have uphill braking into 2 but the braking area is quite bumpy here. Keep to the right hand side of the white line running up the left of the track. Its tempting to go over it and use the extra foot of tarmac on the other side but this acts as a drainage gully so has large drain grates dotted along its length. Turn in just before the marshals hut on the left and use the kerb on the inside, avoiding the yellow sausage. This corner climbs steeply as you go through it so it is difficult to get the car to do exactly as you want it too. A touch too fast on the turn in and the front will wash wide, a touch too slow and you will get a load of power oversteer on the exit as the weight distribution shifts mid corner. Getting the power down is important here as the first bit of acceleration out of the corner is uphill. Avoid the kerb and grass mat on the exit as this will reduce your traction as you accelerate. You’ve passed the high point on the circuit now so the rest of your braking and corner entries are all down hill. Brake early onto the left hand side of the circuit ready for the corner. The braking zone is bumpy here. Turn in late to the corner, approx 1 car length before the access road on the left of the circuit. Your turn in is approximately the same speed as turn 2 above even though the corner is more open as the downhill entry makes the car hard to turn in. Keep the brake on as you turn in to keep the weight over the front and make sure you get the front of the car into the apex kerb then feed in the power as you walk out to the left, coming alongside the exit kerb about two-thirds of the way along its length. Keep turning to the right to ease the car back over to the right for turn 4. Come alongside the right hand side of the circuit just after the ‘150’ marker. As you go over the crest the corner will start to appear. Brake early and relatively gently and keep the brake on into the corner to keep the weight over the nose and to help the turn in. Turn in about 1 length after the ‘50’ marker and slowly wind the lock into the corner as the car slows on the brake. 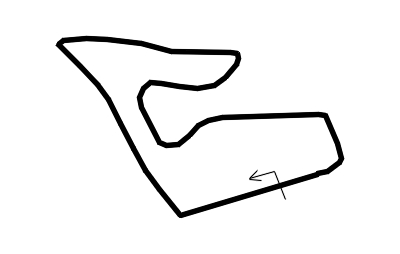 Hold the apex for a moment then release the turn and power out as the next short straight comes into view. Use the kerb on the exit. Squeeze the brake and turn in alongside the access road on the right. Use the brake to help rotate the car in towards the apex kerb. Use the kerb and the grass inside it and get the power on as early as you can whilst making the following right a flat out kink. Exit the first part of the corner on the right hand kerb and follow this until it ends (and a little bit of dirt beyond) then let the car drift out to the left on the exit. Avoid the kerb on the left on the exit as it ends too soon which will leave you on the grass. A short straight then a short, sharp brake for the last turn. Down hill entry again but a really short apex so rotate the car a bit on the brake then grab what kerb you can on the apex getting full on the power before you get to the inside of the corner. Run out onto the exit kerb then stay on the left all the way down to the first turn again.